How Are Kitchen Cabinets Installed? The Cabinets go up in a single day, though they do look very incomplete without the countertops. All of the cabinets are mounted to the studs in the walls for a strong and secure fit that will last for many years. You will notice that the plumbing and electrical lines are also run inside the cabinets spaces for the additions of the sinks, outlets and other items that will mount to the finished cabinets. 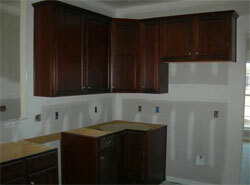 Installing kitchen cabinets may seem daunting, but the procedure is really not that difficult. Follow this simple guide and your new cabinets should be fastened to your walls with no problems. This article will talk about how to properly install kitchen cabinets. Before installing the new kitchen cabinets, make sure to take down the previous ones and make any electrical or plumbing changes before the installation begins. This way there are no surprises half way through the job. This step is necessary to ensure that you start working with a clear area and mind. The following instructions are useful in helping homeowners learn how to remove their old cabinets and how to properly install new ones. (1) Remove the old cabinets and make sure to repair any holes you leave behind. (2) Use a stud finder to locate wall studs. Mark these vertically by using a chalk line. (3) Measure about 54 inches from the floor and snap a horizontal chalk line. (4) Start from the highest floor point and nail a 1x3 piece of wood and temporarily level it. (5) Place an end or corner cabinet on the temporary straight and make sure it is properly leveled. Drill holes on the hanging strip located above the cabinets and into the wall studs. (6) Install the remaining wall cabinets and make sure they fit snug against the first one. (7) Clamp all the cabinets' face frames together. (8) If there is a remaining gap in the wall junctures, use a filler strip to fill them up. (9) If there are gaps between the cupboards placed over the sink, fill these up with valance or decorative molding and use counter bore screws to secure. (1) Make sure any new flooring is installed before you secure the base cabinets. If you cannot finish your new flooring before you install the base cabinets, use a piece of your new flooring as a spacer. Make sure it measures exactly what the rest of the floor will be. (2) Again mark stud locations. (3) Make sure to mark level lines of the base cabinet's height at the highest point of your floor level. (4) Set your new cabinet in place. (5) Start drilling pilot holes into the studs. Use a drill screwdriver to drive screws through the framing of the cabinet. (6) Once secured, use a hammer and a chisel to remove any shims you see. (7) Clamp the face frames of adjacent cabinets together using counter bore screws. (8) For remaining bottom cabinets, follow steps 5 to 8. When installing new cabinets, it is important to remember that you should be able to measure carefully the area where your cabinets will be installed. Also, it is important to install wall cabinets first before base cabinets so that you will not have to lean over the base cabinets. Another thing to remember is to remove all cupboard doors before installing so that it will be easier and lighter to handle. Lastly, make sure to use screws which are specified by the cabinet manufacturers.